In 2004, when Gmail was launched, I was amazed by the incredibly large 1GB capacity of the free service. The ability to instantly search a large volume of email was amazing. As someone who never deleted messages and still had messages dating back to 1994, I immediately looked for a way to import my existing mail into the new service. When I couldn’t find such an option, I decided to make one for myself. My tool works by reading the local mail file and remailing it to the new destination, one message at a time, into your Gmail account. With the exception of the time stamp shown in the inbox, it works quite well for relocating your messages. Unfortunately, as a way to control spam, many ISPs now prevent residential accounts from directly sending mail in this way. 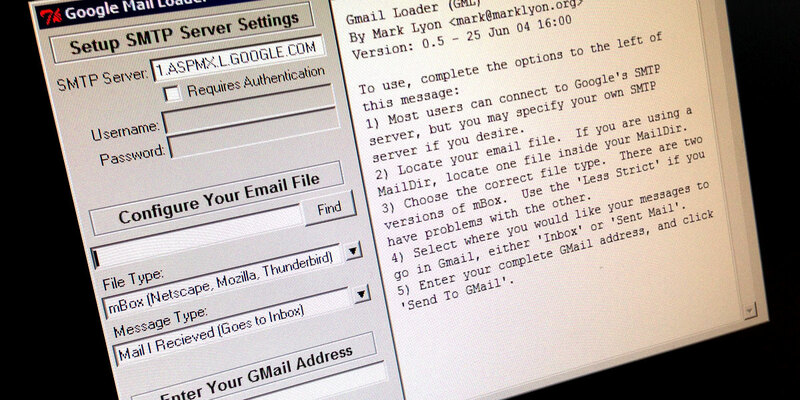 In the intervening years, the Google Mail Loader has been used by thousands of people to upload their existing mail. Uploading became so popular that in 2009 Google finally began to provide a built-in mechanism for importing mail from many major webmail providers. These new options are superior methods for importing mail. Importing mail and contacts from another major webmail provider (Yahoo, Hotmail, AOL and similar providers). Importing mail from an external server, not supported by the previous method (including other Gmail accounts) using a POP server. If you’re using Google Apps with your own domain, please make use of the options listed here. If you’re unable to use any of the above methods and want to move mail from your local computer, enable IMAP and add your Gmail account to your existing mail program (using IMAP). Once the new inbox appears, drag and drop messages from your existing inbox into the Gmail inbox. This method bypasses many ISP restrictions and preserves the original dates. Please note: Google has altered their MX servers. The most frequent problems involve using SMTP servers (which require authentication) instead of MX servers (which accept mail from the wider internet) as the destination. For the mail server address, use one of the values listed on the MX servers page like ALT1.ASPMX.L.GOOGLE.COM. If you’re looking for a way to archive and back up your Gmail account, I recommend GMVault. I’ve also heard good things about the YippieMove service and was recently alerted to Shuttle Cloud, both of which do the migration work for you. To convert OLM to PST Outlook 2013, you need a tool that can convert the files. But most of them would fail to pick up each element and leave PST files damaged. This tool fully supports the conversion of text and characters in all languages. You won’t find anything missing or broken. Algorithms used to preserve non¬-English content are also applicable to contacts and calendar conversion.